Why Does My Air Conditioner Need Refrigerant? Is your air conditioner acting weird? Some air conditioner problems are more subtle than others, so we understand why some AC problems go on longer than they have to. Not knowing any better, you might think that the symptom your AC is experiencing will disappear after a few hours. More likely, you end up forgetting about it until it becomes too big of a problem to ignore. In that case, we want to inform you of a few big issues that can save you from having to call for an AC catastrophe. This is the first place where people usually notice that something is wrong. Most homeowners aren’t trained to know the more subtle signs of air conditioning problems. Unless the AC is making horrible noises or acting erratic, it won’t be until the next month’s energy bill that you’ll notice anything is wrong at all. The reason this usually happens is that one component of the AC is no longer working like it used to. Each part of the AC relies on each other to be operating at optimum performance, so one busted part will create a domino effect, forcing the AC to work harder than usual. If your energy bill has suddenly skyrocketed, don’t simply assume it’s because you’ve been using it more. It could be a cause for investigation. Your air conditioner is supposed to blow cold air from the vents. So if it’s blowing anything but cold air, then there’s definitely a problem! The source of the problem may be as simple as a clogged air filter, which only needs replacing. On the other hand, it could be due to any number of component failures, such as a burnt out fan motor. 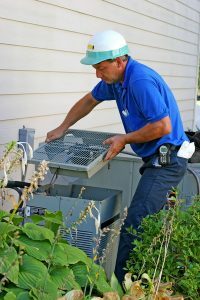 The worst case scenario is that you have a broken compressor or a frozen evaporator coil, both of which could be caused by a refrigerant leak. In the event of airflow issues, we recommend having the whole system checked by an air conditioning repair service in Riverside, CA. Speaking of refrigerant leaks and air flow… A frozen evaporator coil could be involved. The condenser coil and the evaporator coil are two major components that are required for your refrigerant-based air conditioner. If one of them fails to work properly, it could spell disaster for your AC. One common occurrence is the frozen evaporator coil—we mean it literally when we say this piece of the AC will be covered frozen and covered in ice! A frozen coil could be the result of a clogged air filter or a refrigerant leak. Regardless of the cause, what it will do is prevent your home from receiving proper air flow (not to mention it will prevent cool air from being created at all). Due to the risks, we again recommend contacting a professional immediately. Notice something weird? Don’t wait to find out! Contact RKM Heating and Air Conditioning to schedule a service.